Gold prices picked up Wednesday on North Korea's successful test-launch of an intercontinental ballistic missile, and gloomy US economic data. Bullion rose as high as $1,228.40 an ounce after US secretary of state Rex Tillerson said last night North Korea’s test represented "a new escalation of the threat" to the country and its allies. 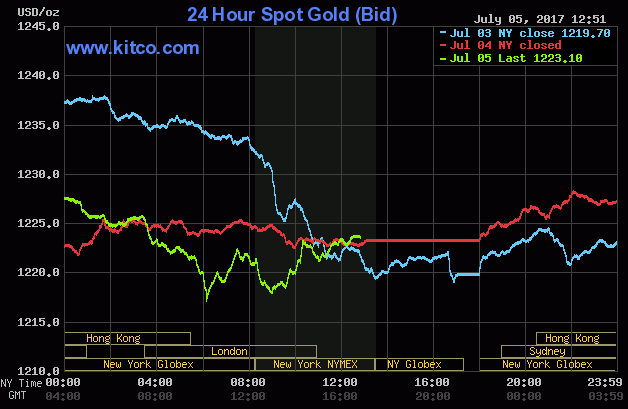 The metal was trading slightly down last at $1,223.60 per ounce, while investors were awaiting the release of minutes from the US Federal Reserve’s June meeting, due Wednesday afternoon shortly after gold futures settle. The market was also looking ahead to employment data on Friday that could influence the pace of rate rises. In the nearer term, analysts at Commerzbank said technical support for gold was around its May low of $1,214.